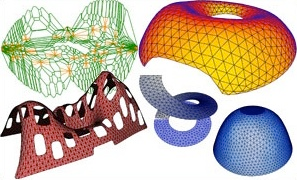 My main research interests are on topics commonly referred to as Geometry Processing: geometry compression, surface approximation, mesh parameterization, surface remeshing, mesh generation and surface reconstruction. 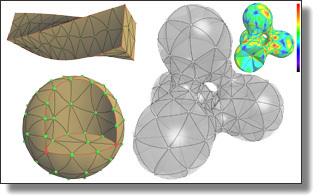 Initially considered as a subfield of Computer Graphics and Computational Geometry, Geometry Processing has developed over the last years into a whole research community seeking automatic, computerized processing of complex shapes. My overall research goal is to design methods which are both theoretically founded and computationally tractable to render them robust to unprocessed inputs, reliable, and, above all, with real impact on technological applications. Targeting these properties requires a complete rethinking of the geometry pipeline and of its foundational algorithms so that bottlenecks (i.e., parts of the pipeline which are too labor–intensive or too brittle for practitioners) are removed. I received the Eurographics Young Researcher Award 2005. I was co-chair of the EUROGRAPHICS Symposium on Geometry Processing 2008, program co-chair of Pacific Graphics 2010 and program co-chair of Geometric Modeling and Processing 2014. I am program co-chair of EUROGRAPHICS 2019 and Solid and Physical Modeling 2019. I was an associate editor of the ACM Transactions on Graphics between 2010 and 2017, of Graphical Models since 2010, and of Computer Aided Geometric Design since 2014. I have been awarded in 2011 a Starting Grant from the ERC (European Research Council), entitled “IRON”, which stands for “Robust Geometry Processing”. I have been awarded in 2017 an ERC proof of concept grant, entitled “TITANIUM” (software components for robust geometry processing). Selective Padding for Polycube-Based Hexahedral Meshing. G. Cherchi, Pierre Alliez, R. Scateni, M. Lyon, D. Bommes. Computer Graphics Forum, Wiley, 2019. Leman Feng, Pierre Alliez, Laurent Busé, Hervé Delingette, and Mathieu Desbrun.ACM Transactions on Graphics (SIGGRAPH), 37(4), Art. 61, 2018. 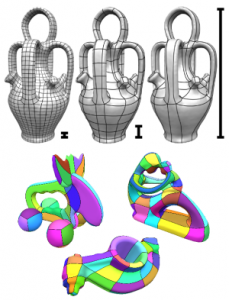 Abstract: Meshes with curvilinear elements hold the appealing promise of enhanced geometric flexibility and higher-order numerical accuracy compared to their commonly-used straight-edge counterparts. 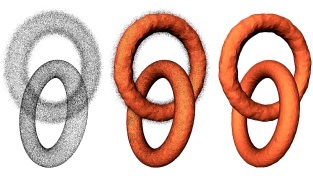 However, the generation of curved meshes remains a computationally expensive endeavor with current meshing approaches: high-order parametric elements are notoriously difficult to conform to a given boundary geometry, and enforcing a smooth and non-degenerate Jacobian everywhere brings additional numerical difficulties to the meshing of complex domains. In this paper, we propose an extension of Optimal Delaunay Triangulations (ODT) to curved and graded isotropic meshes. By exploiting a continuum mechanics interpretation of ODT instead of the usual approximation theoretical foundations, we formulate a very robust geometry and topology optimization of Bézier meshes based on a new simple functional promoting isotropic and uniform Jacobians throughout the domain. 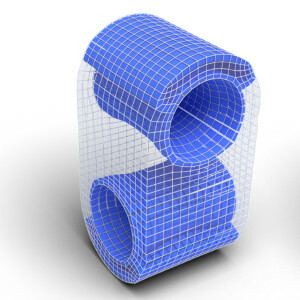 We demonstrate that our resulting curved meshes can adapt to complex domains with high precision even for a small count of elements thanks to the added flexibility afforded by more control points and higher order basis functions. Manish Mandad, David Cohen-Steiner, Leif Kobbelt, Pierre Alliez and Mathieu Desbrun. ACM Transactions on Graphics (SIGGRAPH), 2017. Abstract: We introduce an efficient computational method for generating dense and low distortion maps between two arbitrary surfaces of same genus. Instead of relying on semantic correspondences or surface parameterization, we directly optimize a variance-minimizing transport plan between two input surfaces that defines an as-conformal-as-possible inter-surface map satisfying a user-prescribed bound on area distortion. The transport plan is computed via two alternating convex optimizations, and is shown to minimize a generalized Dirichlet energy of both the map and its inverse. Computational efficiency is achieved through a coarse-to-fine approach in diffusion geometry, with Sinkhorn iterations modified to enforce bounded area distortion. 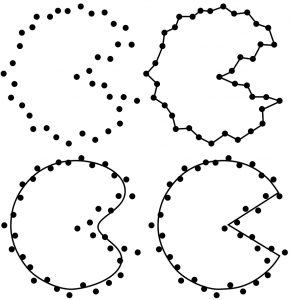 The resulting inter-surface mapping algorithm applies to arbitrary shapes robustly, with little to no user interaction. Max Budninskiy, Beibei Liu, Fernando de Goes, Yiying Tong, Pierre Alliez, and Mathieu Desbrun. ACM Transactions on Graphics (SIGGRAPH Asia), 36(6), 2016. Supplemental Material. Abstract: This paper presents a variational method to generate cell complexes with local anisotropy conforming to the Hessian of any given convex function and for any given local mesh density. 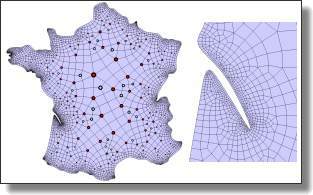 Our formulation builds upon approximation theory to offer an anisotropic extension of Centroidal Voronoi Tessellations which can be seen as a dual form of Optimal Delaunay Triangulation. We thus refer to the resulting anisotropic polytopal meshes as Optimal Voronoi Tessellations. Our approach sharply contrasts with previous anisotropic versions of Voronoi diagrams as it employs first-type Bregman diagrams, a generalization of power diagrams where sites are augmented with not only a scalar-valued weight but also a vectorvalued shift. As such, our OVT meshes contain only convex cells with straight edges, and admit an embedded dual triangulation that is combinatorially-regular. We show the effectiveness of our technique using off-the-shelf computational geometry libraries. Symmetry and Orbit Detection via Lie-Algebra Voting. Zeyun Shi, Pierre Alliez, Mathieu Desbrun, Hujun Bao, and Jin Huang. Abstract: In this paper, we formulate an automatic approach to the detection of partial, local, and global symmetries and orbits in arbitrary 3D datasets. We improve upon existing voting-based symmetry detection techniques by leveraging the Lie group structure of geometric transformations. In particular, we introduce a logarithmic mapping that ensures that orbits are mapped to linear subspaces, hence unifying and extending many existing mappings in a single Lie-algebra voting formulation. Compared to previous work, our resulting method offers significantly improved robustness as it guarantees that our symmetry detection of an input model is frame, scale, and reflection invariant. As a consequence, we demonstrate that our approach efficiently and reliably discovers symmetries and orbits of geometric datasets without requiring heavy parameter tuning. Matthew Berger, Andrea Tagliasacchi, Lee M. Seversky, Pierre Alliez, Gael Guennebaud, Joshua A. Levine, Andrei Sharf and Claudio Silva. Computer Graphics Forum, 2016. Extended version of a EUROGRAPHICS state of the art report. The area of surface reconstruction has seen substantial progress in the past two decades. The traditional problem addressed by surface reconstruction is to recover the digital representation of a physical shape that has been scanned, where the scanned data contains a wide variety of defects. 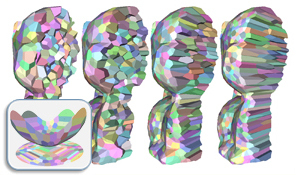 While much of the earlier work has been focused on reconstructing a piece-wise smooth representation of the original shape, recent work has taken on more specialized priors to address significantly challenging data imperfections, where the reconstruction can take on different representations – not necessarily the explicit geometry. We survey the field of surface reconstruction, and provide a categorization with respect to priors, data imperfections, and reconstruction output. By considering a holistic view of surface reconstruction, we show a detailed characterization of the field, highlight similarities between diverse reconstruction techniques, and provide directions for future work in surface reconstruction. Yannick Verdie, Florent Lafarge, Pierre Alliez. Indoor Scene Reconstruction using Feature Sensitive Primitive Extraction and Graph-cut. Henrik Zimmer, Florent Lafarge, Pierre Alliez and Leif Kobbelt. Proceedings of Geometric Modeling and Processing 2014. 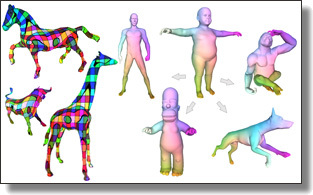 State of the Art in Surface Reconstruction from Point Clouds. Matthew Berger, Andrea Tagliasacchi, Lee Seversky, Pierre Alliez, Joshua Levine, Andrei Sharf, Claudio Silva. EUROGRAPHICS State of the Art report, 2014. CGALmesh: a Generic Framework for Delaunay Mesh Generation. Clément Jamin, Pierre Alliez, Mariette Yvinec, Jean-Daniel Boissonnat. ACM Transactions on Mathematical Software, Association for Computing Machinery (ACM), 2014. Fernando de Goes, Pierre Alliez, Houman Owhadi and Mathieu Desbrun. Simon Giraudot, David Cohen-Steiner and Pierre Alliez. Florent Lafarge and Pierre Alliez. Bertrand Pellenard, Jean-Marie Morvan and Pierre Alliez. 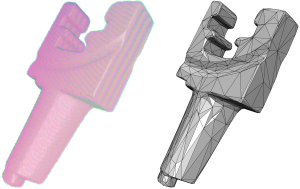 Feature-Preserving Surface Reconstruction and Simplification from Defect-Laden Point Sets. Julie Digne, David Cohen-Steiner, Pierre Alliez, Mathieu Desbrun, Fernando de Goes. Adrien Maglo, Clément Courbet, Pierre Alliez and Céline Hudelot. Proceedings of Shape Modeling International 2012. Bertrand Pellenard, Pierre Alliez and Jean-Marie Morvan. Abstract: We propose an approach for automatically generating isotropic 2D quadrangle meshes from arbitrary domains with a fine control over sizing and orientation of the elements. At the heart of our algorithm is an optimization procedure that, from a coarse initial tiling of the 2D domain, enforces each of the desirable mesh quality criteria (size, shape, orientation, degree, regularity) one at a time, in an order designed not to undo previous enhancements. 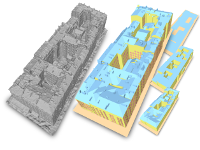 Our experiments demonstrate how well our resulting quadrangle meshes conform to a wide range of input sizing and orientation fields. Fernando de Goes, David Cohen-Steiner, Pierre Alliez, and Mathieu Desbrun. Symposium on Geometry Processing, 2011. Abstract: We propose a robust 2D shape reconstruction and simplification algorithm which takes as input a defect- laden point set with noise and outliers. We introduce an optimal-transport driven approach where the input point set, considered as a sum of Dirac measures, is approximated by a simplicial complex considered as a sum of uniform measures on 0- and 1-simplices. 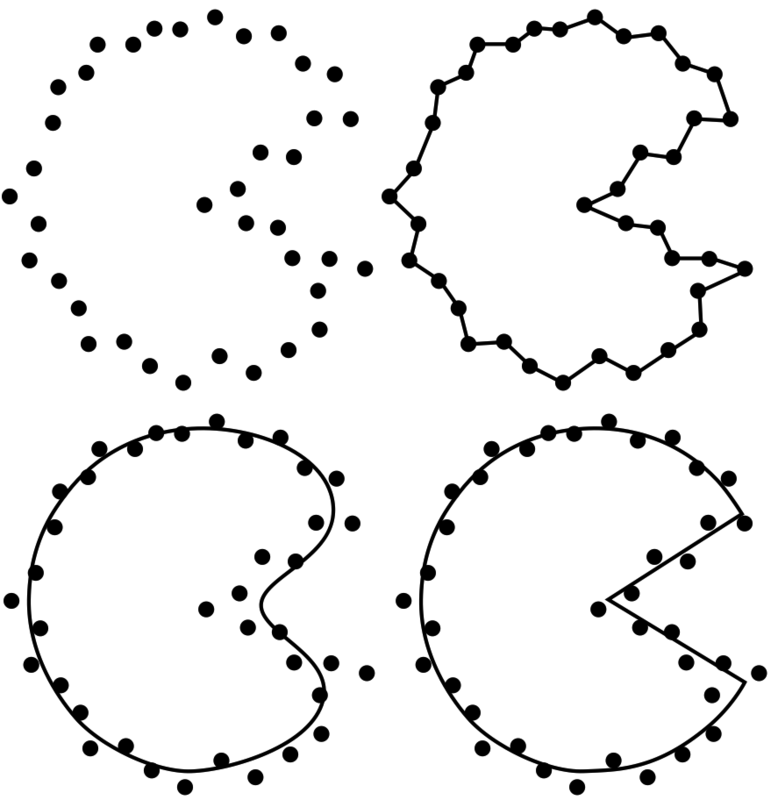 A fine-to-coarse scheme is devised to construct the resulting simplicial complex through greedy decimation of a Delaunay triangulation of the input point set. Our method performs well on a variety of examples ranging from line drawings to grayscale images, with or without noise, features, and boundaries. Mario Botsch, Leif Kobbelt, Mark Pauly, Pierre Alliez and Bruno Levy. AK Peters, ISBN 978-1-56881-426-1, 2010. Abstract: Geometry processing, or mesh processing, is a fast-growing area of research that uses concepts from applied mathematics, computer science, and engineering to design efficient algorithms for the acquisition, reconstruction, analysis, manipulation, simulation, and transmission of complex 3D models. 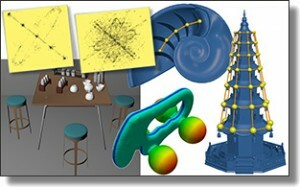 Applications of geometry processing algorithms already cover a wide range of areas from multimedia, entertainment, and classical computer-aided design, to biomedical computing, reverse engineering, and scientific computing. 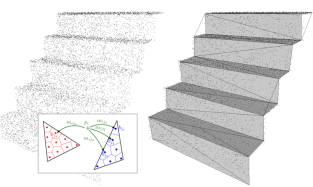 Over the last several years, triangle meshes have become increasingly popular, as irregular triangle meshes have developed into a valuable alternative to traditional spline surfaces. This book discusses the whole geometry processing pipeline based on triangle meshes. 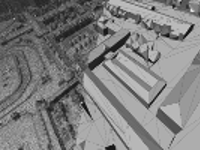 The pipeline starts with data input, for example, a model acquired by 3D scanning techniques. This data can then go through processes of error removal, mesh creation, smoothing, conversion, morphing, and more. 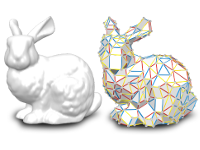 The authors detail techniques for those processes using triangle meshes. – 2006-2009: Jane Tournois (PhD on mesh optimization), now at Geometry Factory. I am an avid user of the CGAL library. I am a CGAL editor and developer as well, implementing or participating to various projects: placement of streamlines from 2D vector fields, planar parameterization of triangle surface meshes, Principal Component Analysis, Surface reconstruction, Point Set Processing and 3D Isotropic Tetrahedron Mesh Generation and Optimization. – Full paper co-chair, EUROGRAPHICS conference. – Program co-chair, SPM conference. – joined editorial board of Computer Graphics Forum for three years. – Joined Horizon 2020 Advisory Group for Societal Challenge 6 ‘Europe in a changing world – Inclusive, Innovative and Reflective Societies. – invited speaker, MICCAI workshop on Mesh Processing in Medical Image Analysis (Nice). – invited speaker, 3DIMPVT: 3D Imaging, Modeling, Processing, Visualization and Transmission (Zurich). – invited speaker, Advances in Architectural Geometry (Paris). – programme committee, IMA Mathematics of Surfaces XIII conference.